Just about everything I have done under my own name in the last few years has been acoustic. Today I did a recording session with some old and new friends, and for a variety of reasons, it ended up being all electric bass and electric keyboards, and it was way fun. I’m sure you’ll hear more about it soon. In the mid-1980’s I was in high school in Lafayette ,LA. I was starting to discover jazz and gobbling up whatever info I could find. A big part of my process of discovery at that time was an NPR show called Sidran on Record. It was an hour long radio program of Ben Sidran interviewing jazz musicians, and playing music. 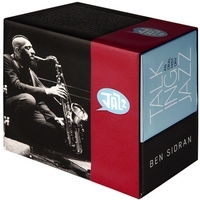 Those interviews are now collected as Talking Jazz, a 24 CD set. The musical selections are missing, and I miss them, but the interviews are great. Carla Bley, Jackie McLean, Archie Shepp, Mel Lewis, Sonny Rollins, Arthur Blythe, Don Cherry, and loads more. The interviews are relaxed; like two musicians talking, which is what they essentially are. The box set is a little expensive, but well worth it. Bill Meyer wrote a nice review of the new Lucky 7s CD, Farragut, in the March issue of DownBeat. 3 and a half stars. I try not to get too wrapped up in reviews, but it is nice when people write good stuff about your music. Here’s a nice piece from the Chicago Sun Times on some of the young free jazz scene players in Chicago. Several of my Lucky 7s compadres get some nice props. They swing, but they play free jazz. That is, they improvise freely (oh, no! ), outside chord changes (shocking! ), and sometimes they’re even arhythmic or atonal (the horror!). Sometimes their music is fierce, with exhilarated honks and explosions. More often, it’s intense, very tight group explorations, often lyrical or abstract or even charming.